Excellent HA (type III) ano. 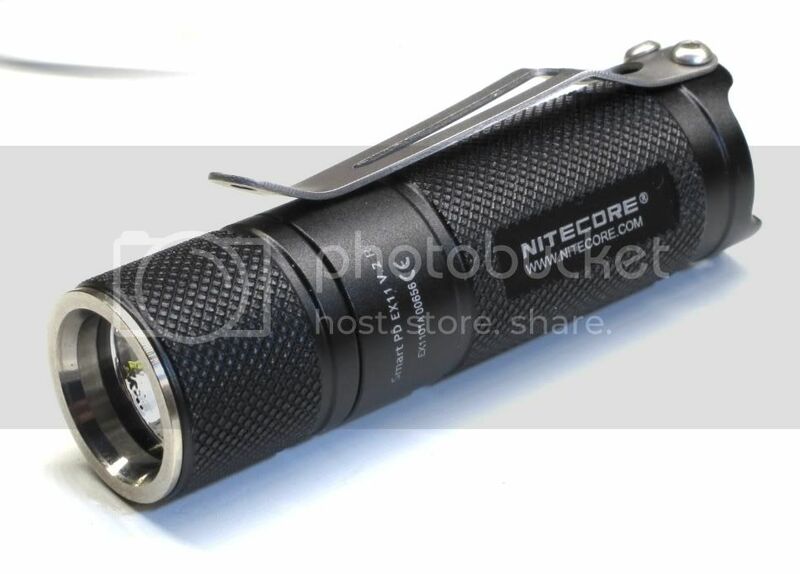 The Nitecore EX11.2 is overall an excellent torch which would fit into the role of an EDC torch very well. 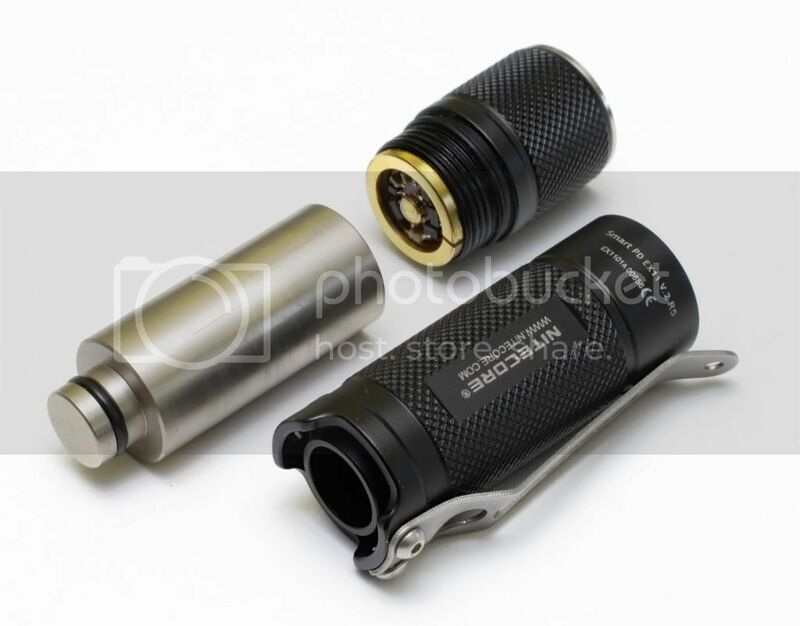 This torch can be summarised as being a very compact 16340 torch with decent output and has provision for installation of an Excellent clip. All this aside, the key defining feature of the EX11.2 is its user interface. Unlike most torches with a tail switch that actually switches power on and off, the EX11.2 uses a digital electronic switch, much the same as how the power switch on your phone is a digital switch. This allows for more to be done with the tail switch, and in the end provides you with an easy to use, and intuitive UI which is actually very practical when it comes to doing real work. 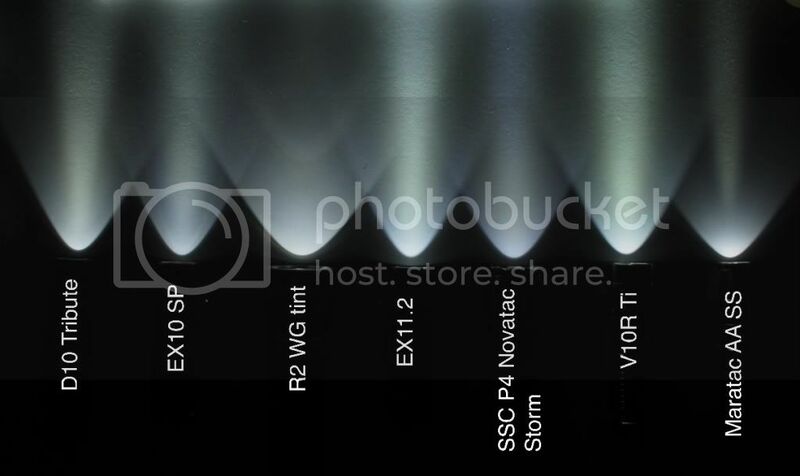 The EX11.2 can be thought of primarily as a single mode torch. A Click toggles the torch on and off. From on, a press will initiate a change in brightness, following what appears to be close to a visually linear ramping sequence. Releasing the button will stop the brightness ramp and the output will be saved to memory. Another press will initiate the ramp again, but in the opposite direction. When you hit the end, it Importantly does NOT continue to ramp in the reverse direction, it just stays at the end of the ramp. Think of the UF-H2 and you will know how frustrating it could be trying to get max/min brightness. The ramping takes about 4-5 seconds from max to min, and feels to be a good balance between being fast enough to get the output you want, vs too fast to control, if not tending toward the slower side (however this is a good thing, see later) The EX11.2 has a visible confirmation flash when you reach either end of the brightness ramp, which is a Very useful feature. 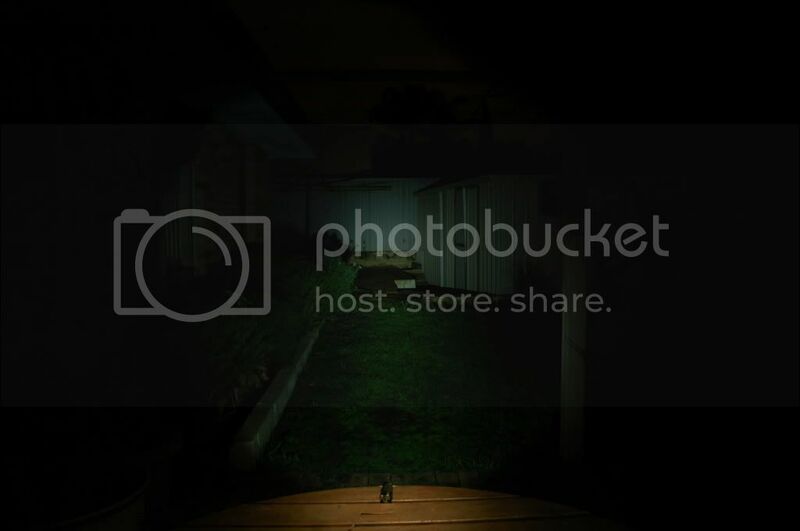 There is a quick flash of slightly brighter light as you hit minimum brightness, while there is a quick dimming of the light as you reach max brightness. This was not as well handled in the earlier EX11 (light turns off completely for too long a time), and is not present in the earlier EX10, but in the EX11.2 I feel that it is Just right and executed perfectly. The key defining feature of the EX11.2, which is what makes this UI so great, are the Shortcuts. From On, A double click immediately sets the brightness level to minimum, while a quick click+press sets the brightness to maximum. This feature is amazingly practical because it makes it possible to access high and low regardless of what brightness setting you were on before, making direct mode selection for high/low possible without needing to cycle through modes or watch the torch, it can be done before you even take the torch out of your pocket. These shortcuts are the reason why the slightly slower ramping speed is perfectly acceptable as you would only really have to use the brightness ramp for less than a second from min or max to access all brightness levels. SOS and Strobe are also available, nicely hidden away from the normal operation, yet easily obtainable. These are accessed by performing the same shortcuts, but from Off. A Double click from off gets you SOS, and a Click+Press gets you strobe. The SOS is a well executed SOS with a pause between each character and a slighty longer pause between each SOS. Its a little slower than in most lights, but clear and easy to understand. The strobe is a little different to a standard strobe with a good speed, but with what appears to be double flashes separated by short breaks, more like [.flash..flash.flash..flash.flash..flash.]. Its fast enough to be good for grabbing attention, but has a high duty cycle, so it isn't as obnoxious as some strobes, but overall quite effective. Also the first part of the strobe appears to go through a couple different speeds before settling down. It feels to me like the strobe is following a short programmed pattern initially before stabilising on the aforementioned strobe, maybe to attract attention to the strobe. The inclusion of the shortcuts when off does have its side-effects on the UI. The normal function of turning the torch on/off has to be delayed slightly, as I will try to explain. If you intended to turn the torch on, you will just be doing a click, but accessing SOS/Strobe requires a double click, or Click+Press from Off. So following a click, the torch must give you some time for you to release the button and then do another click or press. The torch isn't yet psychic, so every time you click, it will wait for another click (or press) command, but its only after a short period of not seeing any further clicks/presses, will it then be able to work out that you only wanted to do a single click, and then turn the LED on or off. The same applies to turn it on or off. This delay is about 0.2-0.3 seconds if I was to take a guess. Coming from the earlier models, this is a little annoying, but on the whole, is not too noticeable. Not often understood is a useful feature, the digital lockout. A Press and hold from Off for more than 2 seconds will lockout the button from accidental activation and prevent you turning the torch on. When locking you will get a quick flash to confirm that the lock has been activated. To un-lock you need to triple click in rapid succession, and the torch will turn on once it is unlocked. Strobe and SOS is also disabled with the lockout enabled. This too has been well implemented and for those who do look for a lockout feature, this is a good way of doing it without having to loosed the head (keeping the torch well intact), however the hardware lockout is also possible if you so prefer. Now back to some history to understand the to the roots of the EX11.2… The earliest model, the ramping EX10 had shortcuts to high/low but did not have strobe or SOS. For the purists, the EX10 represents the essence of flashlight UIs, and its AA counterpart, the D10 achieved legendary status with almost a cult following, it even had its special Tribute runs.. Anyways, I digress. Following this model, the EX10 SP was released. This had done away with the ramping, and instead gave you 3 levels, low/mid/high in that order, and the shortcuts from On instead gave you SOS/Strobe. This was practical, and well executed, but lost some "cool" factor. A successor model, the EX11 brought back the ramping, but the shortcuts still gave you SOS and strobe, which IMO was the worst combination, because the ramping became a nuisance without the shortcuts to high/low. 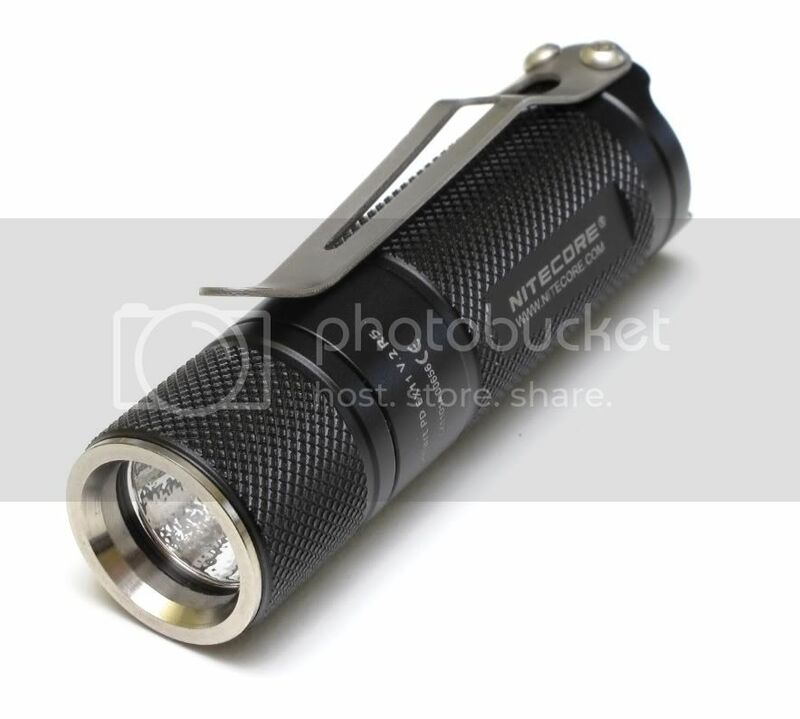 Nitecore managed to turn what was was very awesome, into just another torch with an annoying UI, So this led to a lot of vocal sadness in the flashlight communities. I guess the EX11.2 is finally where they get it right again, where the shortcuts to high and low are back, and they have also managed to keep the SOS and Strobe but tuck it away neatly. The EX11.2 (and D11.2) hasn't appeared to have gathered the same following as the original D10 yet. The EX11.2 is mechanically the same as the previous model, the EX11 (version 1), and very similar to its predecessors the EX10. The torch can be thought of as 3 main parts, the head, the body, and the piston. The head houses the optics, emitter and driver. 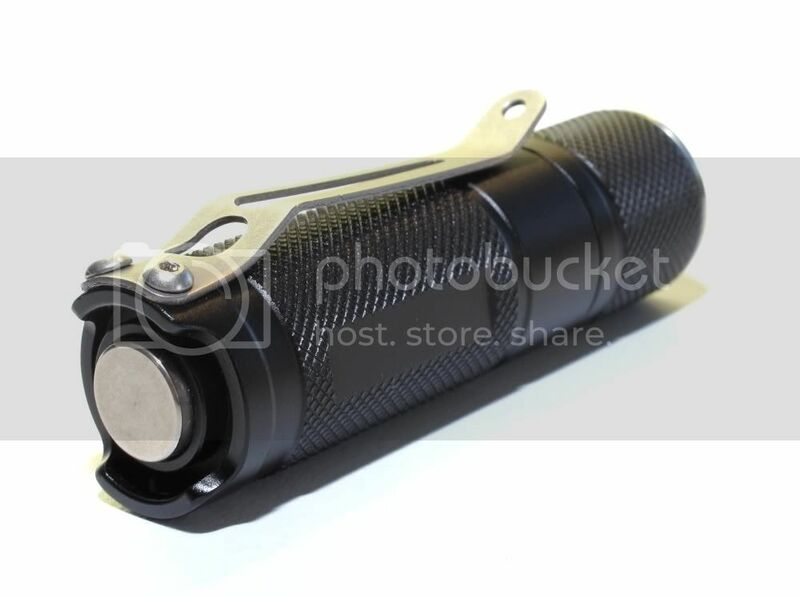 The piston is a fancy battery sleeve which holds the battery, and acts as the negative electrical return to complete the circuit, however it also protrudes out the back and forms the tail switch button, transferring the mechanical switching forces to the switch on the driver board in the head. The body is the last part which holds the piston in place, and guides its movement. This newer model has the o-ring on the slimmer part of the piston instead of the wider part, and from a waterproofing/dustproofing point of view, this is a welcome improvement. The piston on the EX11.2, the switch, has an interesting feel. It has about 1.5mm of throw (movement) and has a sort of firm stop when you reach the end of throw. The switch feel of this EX11.2 compared to my other nitecores can be described as having a slightly squishier end feel, and a little too much spring pressure. Compared to my EX10, this is improved, however it still doesn't feel as good as the D series, with all of my D10s having a Much more balanced yet more positive feel. The heavier spring in this EX11.2 can reasonably quickly become too heavy for comfort if ramping for longer periods. I think compounding factors include 2 slightly heavier springs, and a shorter battery bay. Oiling of the piston is also a very important factor, and requires a little bit of care and maintenance to maintain a good switch feel, the key lies in preventing over-oiling. Excessive Oil on the piston can lead to stickiness in the switch feel, and make it difficult to activate. When you receive the torch, I would highly recommend that you remove all the lube from the piston (and body), and apply a very light coating of a light oil to the o-ring itself, and ensure nothing gets onto the flat part of the piston and the corresponding surface on the tube. The problem of over-lubing and using the wrong oil has always plagued many nitecore owners, but with some careful application of a little bit of light oil in the right place, the switch can feel many times better. This gets us to another issue with battery lengths. The piston is designed for CR123s, strictly 16340s, so anything longer than 34mm will affect piston travel and either prevent switch operation, or make switching heavier. I have been using the AW 16340s, and they work fine. Alternatively CR123s fit in well too. 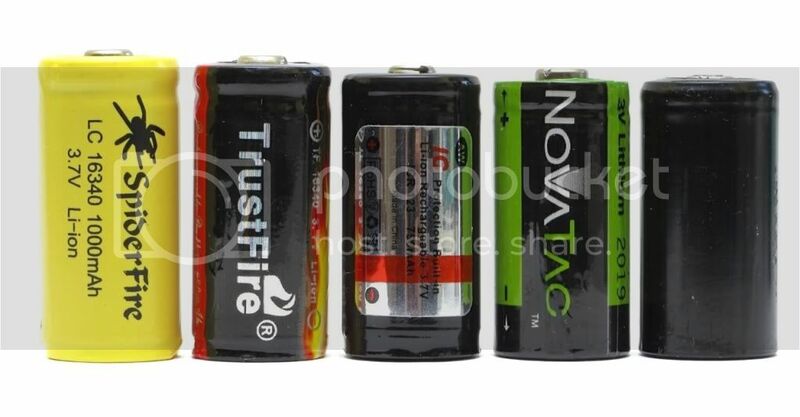 The use of our trust fire cells is only possible if the protection is removed, but this is something that you must do at your own risk because there is no LVC on this torch, which works regulated down to 1.9V, and will still produce light down to 0.7V! 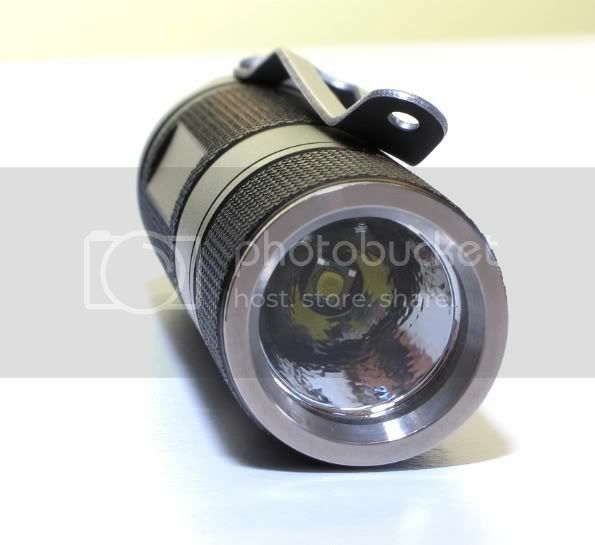 Waterproofing of this torch is not bad, with a good o-ring seal at the body/head interface, an o-ring between the glass and the reflector (and against the head) and a third o-ring on the narrow part of the piston to seal the back end. The o-rings in the head are pretty well sized and fit nicely, which being static should give a decent seal, while the one in the piston is moved when the piston is activated. I've used my torches in a bucket with no leakage, however with this design, I wouldn't push my luck too far with diving due to the switching requiring movement of the oring in the tail when activating the switch. The anodising is clean, uniform and has a somewhat shiny, slightly coarser appearance which feels good. Knurling is a medium depth diamond which feels mildly grippy, but not the heaviest, nor the lightest. Probably slightly heavier than most chinese lights. Knurling is all around the head, and most of the body, with 2 smallish flats milled on the body within the knurled area. Threads are anodised, and are functionally smooth, with some noise created by the HA anodised finish, but definitely well made, even with no 'crunchyness' of the bad kind. I cannot totally recall, but I think they came appropriately lubed, because I routinely re-lube new torches anyway. The tail end is about the level of the button, to allow tail standing, but there are 2 notches taken out, maybe for thumb access. These notches align well with the clip in a cigar grip to allow good access to the button, even with thin gloves. I haven't tried thicker gloves, but it should be doable. Tailstanding is compromised by the notches, but overall given the short length, still relatively doable. Something that is Very much worth mentioning is that the edges of the tail have been Very well rounded in manufacturing. These provide for a shape that is very easy on the fingers (thumb) compared to 'tactical' tail caps. On one of the raised parts of the tail there is an elongated hole for lanyard attachment, while on the other side there are 2x M2 threaded holes for clip installation. The clip that takes its place is about one of the best clips ever made for a torch. 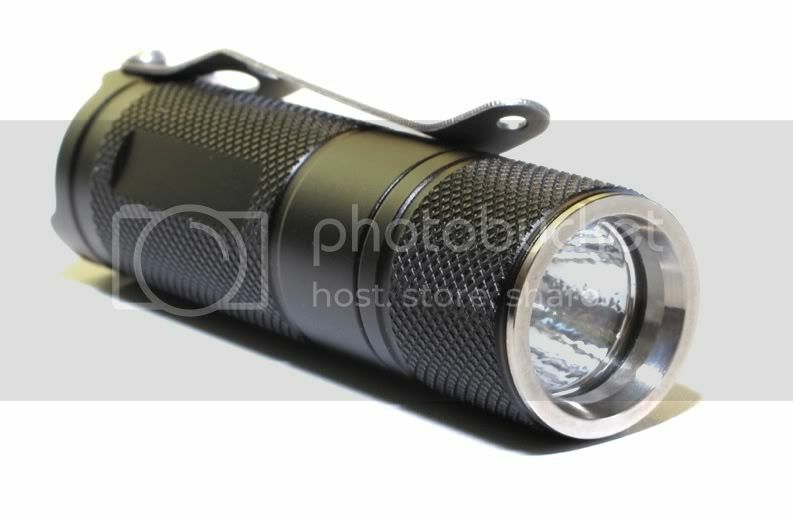 I would strongly recommend that the clip be purchased with this torch if you have ever thought of trying a clip. Its a titanium allow clip which looks slick, and is soft enough to fit your front pocket, yet reasonably grippy enough to stay there. On pants, it does pretty well, and is quite retentive. Not too grippy that it destroys pockets, but enough to withstand some pulling. I might be more comfortable with inside pocket carry though, which is ideal a torch of this size. Writing on the body appears to be laser etched and is very clean and defined with nice sharp edges. 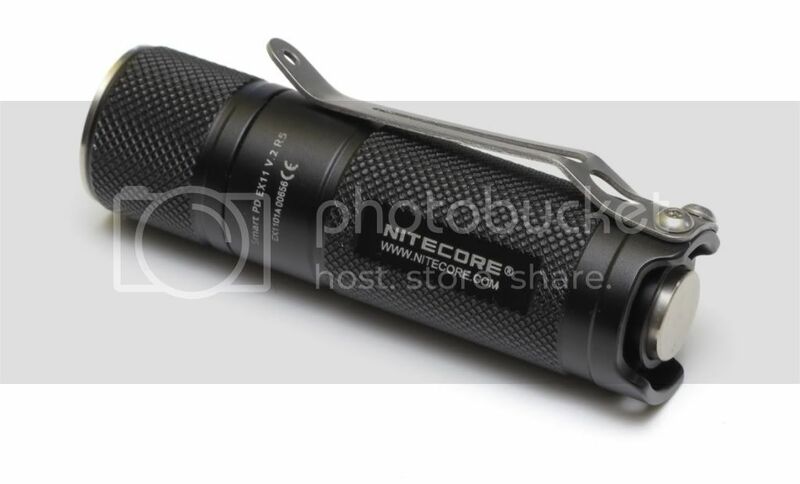 Labelling includes the torch model, serial and a CE logo on the round of the body, while the flats have the NITECORE label and the web address on the same side. Overall not excessive, and cleanly executed. 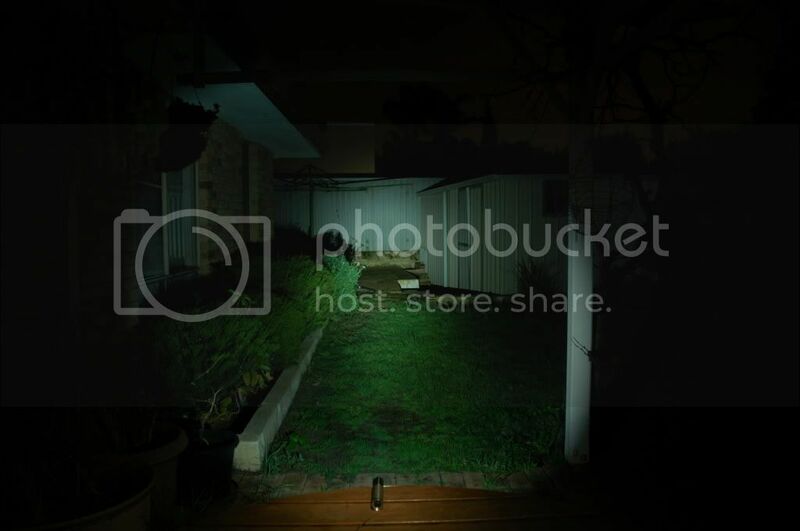 Overall, the build quality of this torch is very much top notch stuff. The design is very sound with decent waterproofing, reasonable tail standing with a good tail design and accessible button, and an AWESOME clip option. With care, the switch feel can be tweaked a little with lubrication, but the heavier switch and the battery size limit may be a problem for some. 4/5 stars, 1 less because of the non-perfect switch feel, the battery size limit, and the not quite as steady tail standing. The Nitecore EX11.2 is a torch with some decent output torch for its size, with the XP-G pushed hard enough for the torch to get quite hot quite quickly (and with an acceptable thermal pathway), yet has a low that goes lower than most, almost in moonlight type territory. This range of brightness, coupled with a variable ramping brightness control allows you to access all brightness levels quite easily. Shortcuts allow high/low to be accessed within half a second, and any other brightness in 3 seconds or less seconds for the experienced operator. Brightness control is done by pressing the button down for longer than 0.3 seconds. The ramping speed is exponential, slow at the start, and faster at the top end, however to the human eye, this appears to be close to being visually linear, and makes the ramping a practical feature. The earlier variants of this torch (EX10, EX11) had a ramping sequence was less exponential and therefore was visually too quick at the low end, and too slow at the high end. The EX11.2 feels to have gotten it about right. It has a cool white tint XP-G R5 bin with what appears to be a slightly greenish tint, Its not sickly green, but at the same time its not a perfectly clean white when placed against other emitters. When used by itself, the tint is quite acceptable. 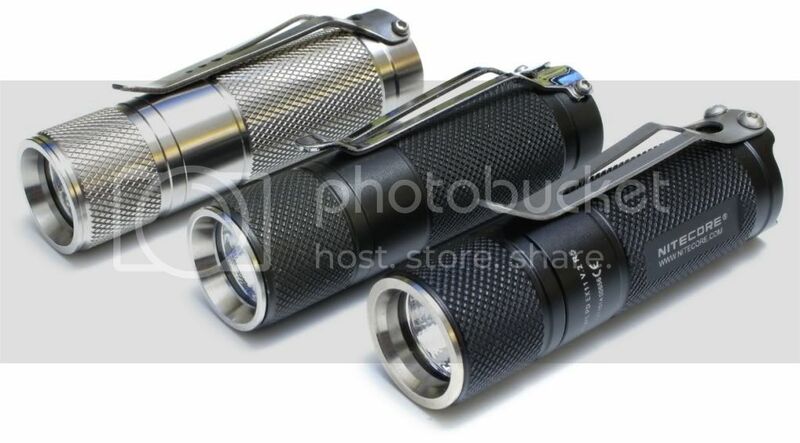 There is a picture comparing other cool white emitter torches that I have to compare against. The most green tint there is the Sunwayman V10R, which has always been and still is the greenest XP-G I've seen. Beam pattern is typical of a OP small reflectored XP-G, with the smooth ring-less beam, defined but soft hotspot with a very slight halo effect. It has a standard wide spill width, and the smooth beam somewhat in the middle between throwy and floody. The sheer output on max (for its size) compared to torches of its size today makes this a little thrower than my other EDCs, but because this is not a beam optimised for throw its nothing spectacular. The flood is nice and bright, with a bright gradual transition toward the hotspot. This beam is ideally suited for close to medium distances, and does well indoors, a great EDC candidate. 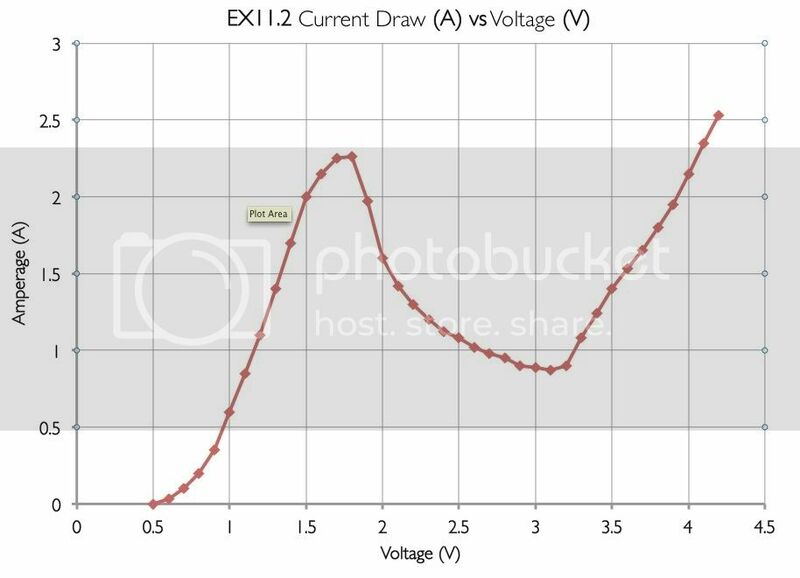 Here you can see the Current draw against the Voltage supply. The driver starts producing light at 0.6V, and that quickly ramps up until you reach about 1.8V, where current reaches a maximum of 2.25A. Beyond this, the driver is able to achieve regulation and the amperage draw drops proportionately, with output maintained at the same level. Above 3.1V, the driver again goes out of regulation and becomes what can be described as direct drive type behaviour, and amperage draw linearly increases, to a crazy 2.5A at 4.2V where the test was terminated. Thats more than 10 watts! 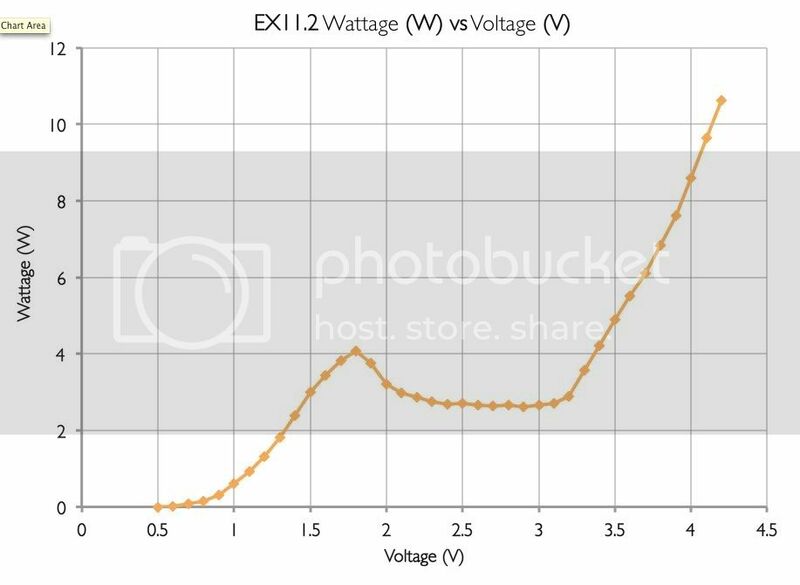 Looking at the graph below, we can see the power draw in watts, and this demonstrates the relatively flat regulation between 2V and 3.1-3.2V. Above and below this the driver is not really running regulated. This has its benefits and disadvantages, and for those who enjoy the "feature" this driver has the potential to pocket rocket on RCRs, but presumably at a much lower efficiency. At the same time, the lack of regulation means that output on RCR will drop-off to a more reasonable level when the battery settles down. LED current was not measured in this test as that would require complete disassembly of the driver/led and in doing so contaminate the optics with dust, not something I want to do yet. The lack of regulation above 3.1V can be seen in two ways. Personally I don't like the idea because it means I cannot be sure that I will be getting the same output, and its not good when using better cells which can deliver more power, especially If I'm looking to neutral mod my torches. Thermal damage to the emitter/driver is quite possible with extended use on good/fresh RCR cells and there has already been a reported case of failure on 14500s in a D11.2 (redforestUK). On the other hand, I have seen many other members who don't like the way some torches have the same output on NiMH/lithium/RCR such as the old EX10 where there were complaints that it wasn't any brighter on RCR. Some see the ability to get a pocket rocket when changing battery type/voltage as a positive feature, which this torch certainly delivers on when moving up to RCRs. So I will leave that up to the user to decide on this element of the design. Low level output is a strong point of the EX11.2, with a low that goes low enough to comfortably look directly at the emitter, and see the lines on the emitter. On lithium primaries, the low is definitely in the decimals of a lumen, definitely moonlight equivalent. Practically, there is rarely any need to go any lower, as it is you can easily see the hotspot across a room but only with night adjusted eyes. 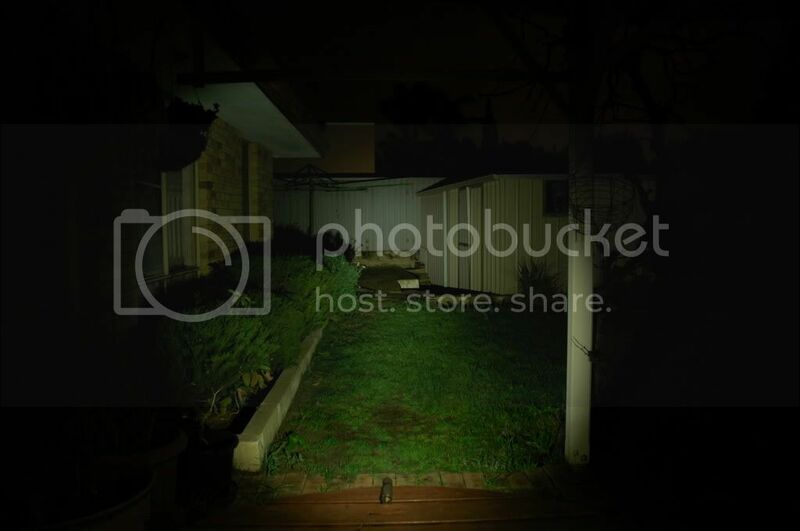 Great for night time prowling... although I tend to find myself needing to turn it up just a little. I think this torch could gain the approval of the low level junkies, without being too low. On RCRs its slightly brighter, however its still much lower than most torches. 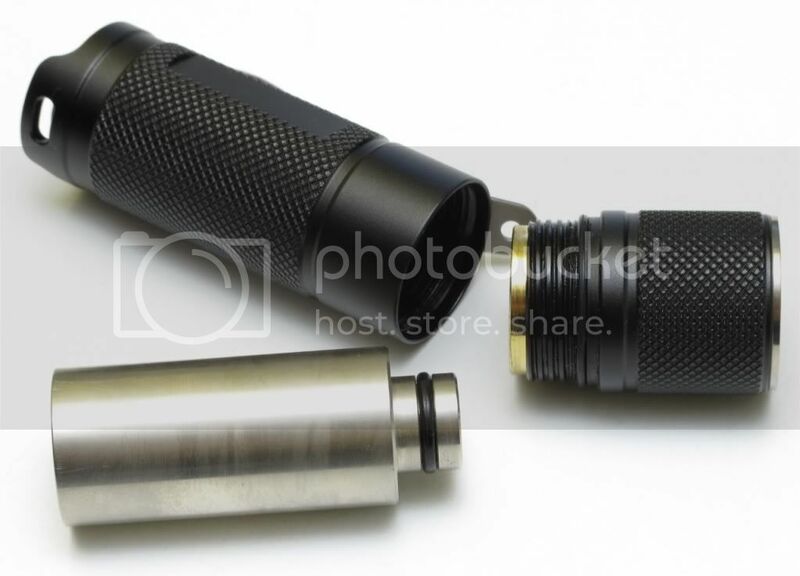 Below is a picture showing the EX11.2 on RCR, compared to other torches on their lowest level. The V10R has one of the lowest lows you can ever see in production torches, and is generally a benchmark to compare against. Battery life is a subjective matter, and with a variable brightness control system, the battery life can be anywhere between a theoretical 20 minutes to 100 hours (4 days). This means that the brightness can be adjusted to the needs of the user, and the option to save a little more power, or to have that little bit more light is available. With the variable system, its not possible to work out power draw and therefore runtimes, so for those that use the torches for extended periods and need to know how many hours to expect, it can be a little trickier, but in my use, which tends to be for short periods over a couple weeks, it doesn't make a difference to me. End of the day, what is more important is the efficiency of the driver circuit, which in this case I would say is not bad for an ultra compact boost driver with a wide input voltage range (can use NiMH) however is no where near as good as a linear driver on a single RCR. Classically the efficiency of the nitecore drivers have been in the 50-60% mark as tested in my D10s on max, with improvements in newer generation nitecore torches. Just from side by side assessments off my PSU, I would guess that its probably another 10% better, but until I get real measurements, I would only use that as a VERY rough guide. Parasitc drain has always been an issue with electronically switched torches, with the early EX10 drawing 0.21mA, (thats 210uA, micro amps), and the EX11 drawing a scary 5mA or so!! This EX11.2 has resolved the parasitic drain issue which plagued the EX11.2, with a measured 6.7uA draw once it properly goes to sleep. In practical terms, thats 5-10 years theoretical battery life in sleep mode from a RCR, and 10+years from a CR123. Realistically 6.7uA is not much more than a RCRs self discharge, and it's that small now that it's practically irrelevant. I wouldn't even bother mechanically locking out the torch unless I was maybe planning to leave it as a backup torch somewhere where I don't expect to be using it for more than a year. Overall, I still give the torch 5 stars for runtime, because of the availability for all brightness levels from pocket rocket to moonlight, and anything in-between to suit any purpose. Also the parasitic drain concerns that many people have are practically irrelevant on this torch to the normal user. The Nitecore EX11.2 is an awesome torch overall. With the single button, it is able to deliver a clean and efficient UI that is well thought out, providing the end user with a product that is very comprehensive and capable, yet something that feels natural and isn't too obtrusive. Finally Nitecore has brought back the excellent features of all its previous offerings to have most of the favourite features available in this one model. I would have liked to see the torch have a wider range of voltages within which regulation is maintained, as I am not a big fan of the direct drive type behaviour. I would also like to see a slightly softer button feel, especially with the availability of the electronic lockout, however it is still well within a usable range. The price point isn't exactly budget, but for what you pay, this is definitely a torch to seriously consider. I only use RCRs, and this is still one of my favourite torches, It does everything I need it to, without the clutter in the UI, and is one of the most compact CR123 torches around, with an awesome clip! 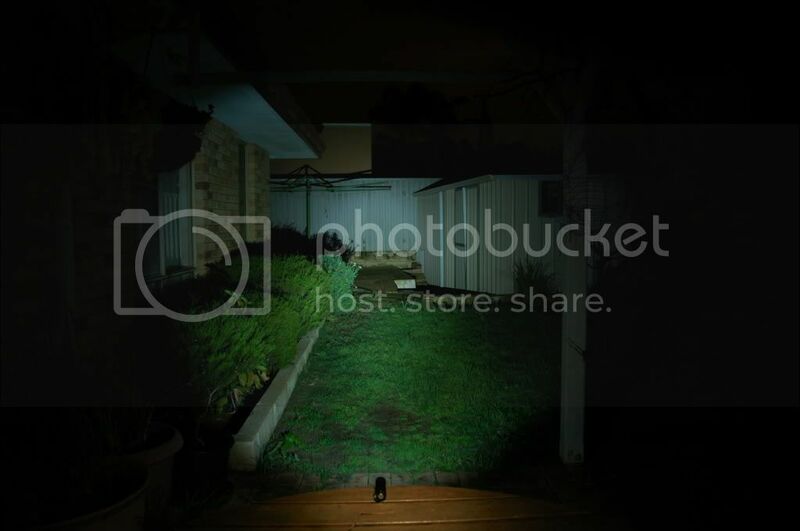 Now, here some outdoor beamshots, with some to compare against. Mouse overs will reveal the EX11.2 beamshot for comparison. There is a little alignment issue with the spill of the EX11.2 not hitting the right column, however the spill is as wide as the other torches. What an absolutely gorgeous looking light. I look forward to the full review! Very Nice review ! Thank you .. Yes, nice review! I wanted to purchase one of these BUT I read of so many lights being returned that were failing one way or another One user had to return (3) of them. Beautiful light, terrific UI. I want it. I think the reviewer, if I'm not mistaken, forgot to mention that is has the ability for momentary on. Also not sure if he said that no protected li-ions would work? I have seen pics of the new Nitecores and am anxiously awaiting their release! Hoo-yah! I have a D11.2 and was frustrated by the fact it sometimes registered double presses when I tried to turn it off and went to ultra low. I have recently fixed that though with some simple deoxit treatment. I also switched the led from the original XP-G R5 to an XP-E Q5, which while increasing current draw/output on 1.28v eneloop from roughly 1.4A-150 lumens (more efficient than H51) to 1.8A-120 lumens has much inproved the usefulness of the beam imo and also given it a very good creamy white tint instead of the crisp but clearly cool white it had before. I would very strongly suggest not using li-ion 14500's in the D11.2 however, as they pull 1.8-2.1A at 4.2v, I fried a D11.2 circuit in my old D10 using one and now it only runs direct drive (although it keeps dimming and strobe etc). its not finished yet, those are just the first 2 sections according to the template. redforestUK, thanks for the heads up. I saw you mentioning it before. Yes, the power draw measurements are ridiculous on 4.2V with the cool emitter, a neutral would not be fun. wow, really nice review about it. If you want buy anything, please contact with me for the magic link, I can give you the lowest price. I don't consider this a flaw, because the light is designed to maximise output on RCRs, with the installed cool white emitter. The installation of a neutral emitter ends up drawing more power, which is not what it was designed for, and therefore failure is expected. My D10s with the neutral mod draws in the order of 2 times the current, from 1A to 2Amps, so with this one currently drawing around the 2+ amp region at 4.2V with the cool emitter, it won't be surprising if it dies with a neutral emitter on RCRs. Its like running an engine from low revs up a higher rev, vs forcing an engine at redline past redline. I bought a Nitecore EX11.2 few months ago and I use it as EDC, only with primary batteries (2-3 months with a single quality CR123a is more than good). In my opinion it has the best UI ever seen in LED flashlights, just perfect. Durable and functional the Pistondrive, useful shortcuts and power-lock function. Good battery life and light output. Simple, small, tough. Unfortunately don't have bought the titanium clip. I think in the future also buy D11.2 and, maybe some of the new models out: DS1, ES1 and ES2. No, sorry, both of my D11.2 samples drew 1.8-2A on a fully charged 14500 cell. Both the one with the original stock XP-G cool white and the one I had modified to use another XP-G High CRI which should have a higher vf and so have been easier to keep current down. I'm not saying it's a flaw in manufacturing or design, just an error in judgement for them to say that their lights support 4.2v cells. That is certainly not the case with the D11.2, perhaps the EX11.2 can support RCR123's, but I have never had one to test. Looking great okwchin! Please let me know when you're satisfied with the review so I can send it frontpage. Gotcha!, yeah the current draw on 4.2V is still crazy. I am compiling the tail cap measures off my PSU now, and its damn right scary. Those components sure can't handle 2A for long. Im with you actually on how this is not truly 4.2V safe, while it might be for a while, its surely not something I would be happy to use for more than a minute straight. I guess this comes back to what manufacturers are willing to advertise, I remember not too long ago on the BLF, there was discussion about why people would want to spend more money on name brand torches, with the common theme being that name brand gives you warranty, and customer support, but for the cost, was advertised/sold with much lower outputs, and dollars per lumen was crazy expensive. I think this is an example of going the other way, where lumens are pushed to the limit, and I think either way we can't entertain everyone. Review is almost there, Just might need a little editing, and adding a few bits here and there as they come to mind. Edited and what's there should be complete now!! So this little fellow is brighter than SkyRay? From the photos it appears to have a noticeably better throw. It will, but only for a short while if on RCRs. The driver unfortunately stays in DD mode for quite a while, and you don't see a regulated output with RCRs, instead you will get a pocket rocket. Ive had mine for a while, and what I would recommend is making a new spring for the driver pill. I still find the switching a tad too hard for my liking, but with a lighter spring, the switching force can be lightened and brought closer to the feel of the good old D10s. Its not easy, but its a UI improvement I feel it needs to make multiple clicks and ramping easier on the hands. totally agree here, but my hand gets a nice workout, or thumb anyway. Someone sell that spring? I just made my spring from some SS wire I had around. Wound it around a screwdriver, and with some careful tweaking to get it as close to round as possible, it works fine. In the EX11, its easier to get it to work smoothly compared to the D11, because the inside of the EX11 is smooth, as opposed to threaded in the D11. It does require some careful work, and I probably spent an your casually making this spring, but its worth it. I dont recall what SS wire i used, but it was probably 0.8 or 0.9mm wire. Mine arrived today and I really like it. I agree the spring resistance makes the button hard to press and slightly less resistance would be nice, but it's ok by me how it is. After reading a bit I see there are different v2 versions floating around, and I ended up with a "Smart PD EX11 SP R5" with "V2" stamped on the opposite side. I was surprised to get one with a slotted piston, which is both good and bad in my opinion, because now I have to go and spend time figuring out how to do the GITD epoxy mod :). I'm leaving the battery in to see if it's a battery vampire which is supposedly fixed now...we'll see! BTW, don't expect anything bright, they are about as bright as cheap DX GITD tail caps after a minute of fade out or so. But the difference is it doesn't need charging, and its glowing when you need it!!... unlike GITD that only glows after you have activated it, i.e. you already have the torch. My EX11.2 ramps smooth on CR123a but on 16340 the ramping is jumpy... anyone else notice that, or am I just special? I also do see a stepped ramping, as if the brightness ramp involved 100+ steps. The original EX10/D10 had a more visibly stepped ramp (50 steps?) but the later EX10/D10s had a ramp with more steps that could not be visibly discerned. The current EX11.2 has steps that are somewhat in-between, smooth, but visible if you tried to look for it. Thanks. I watched it more carefully and on 16340 it does do what you describe. I'm glad it's normal!